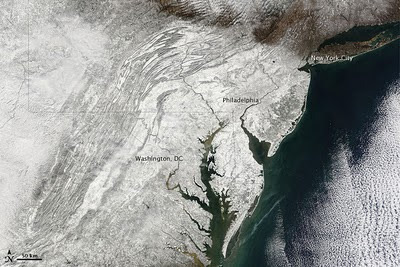 Physics Buzz: How Much Snow did Washington DC REALLY Get? You may have heard about the record-breaking snowfall in the Washington DC area this winter. The flaky white stuff has pounded the region all winter, in successive snow storms locally dubbed "The Snowpocalypse," "Snowmageddon," and the most recent "Snowverkill." These storms, on top of several smaller unnamed squalls, have dumped 55.6" total inches on the nation’s capital as of Thursday morning. However how much is 55.6" of snow really? Of course all this snow didn't come all at once, and represents a cumulative amount for the entire winter so far. But still, that's a lot of snow if you think about it. A whole lot. Washington DC looks like a 10 x 10 mile square with a bite taken out of it. All together the city is 68.3 square miles. It's not too hard to figure out the total volume of snow dumped on the city so far. 55.6" depth of snow x 68.3 square miles roughly equals 8,820,000,000 cubic feet of snow, or 249,000,000 cubic meters. If you were to build a giant cube of snow that big it would be 2,066 feet, or 629 meters on each side. That's almost two fifths of a mile or two thirds of a kilometer per side. That's the volume of about 238 Empire State Buildings. That's a lot of snow. If you took that snow cube and placed it on the national mall, that cube would be 3.72 times taller than the Washington Monument! It would be the tallest building in city, it would be the tallest building in almost any city. Only the world's tallest building the Burj Khalifa would be slightly higher. It would stretch the entire length of the reflecting pool between the Washington Monument and the Lincoln Memorial, with 37 feet to spare. How much would all that weigh? That's a little trickier, because snow doesn't have a uniform density. A cubic foot of really light fluffy snow is going to weigh a lot less than the really wet soggy snow, so in order to calculate this we’re going to have to estimate how much liquid water went into making all of this snow. There's a rough rule of thumb that says ten inches of snow generates about one inch of rain. Researching this at the National Snow and Ice Data Center, I found that ten inches of snow can contain anywhere from 0.1 inches to 4 inches of rainfall. Their Q & A on the site says "The majority of U.S. snows fall with a water-to-snow ratio of between 0.04 and 0.10." This gives us a range to work with, that ten inches of snow can yield between 0.4 and 1 inch of rain. This means that the season's snowfall would have generated between 2.26" and 5.56" of rain. Plug these depths into the area of the city and you get the possible volumes of rainwater. 2.26" x 68.3 sq mi = about 359,000,000 cubic feet, or 10,600,000 cubic meters of water. 5.56" x 68.3 sq mi = about 882,000,000 cubic feet or 25,000,000 cubic meters of water. That's enough to fill between 4,000 and 10,000 Olympic-sized swimming pools. That's between 10,000,000 and 24,600,000 tons or 10,200,000 and 25,000,000 metric tons! That's the weight of between 99 and 243 Nimitz class aircraft carriers! Thought of another way, all the water that has fallen on Washington DC this winter is equal to the average amount of water that goes over Niagara Falls in 90 to 220 seconds. That's a lot of snow if I do say so myself.